Henry Wadsworth Longfellow said, "The best thing one can do when it's raining is to let it rain." And so today, even though I would have much rather been doing layback spins under the morning sun, I let it rain. While I thought of something to cook I studied for my upcoming Latin exam on the Vulgate (the Bible translated into Latin) and read a few chapters of "Leviathan" by Thomas Hobbes for my social contract class. Suffice it to say that after a few chapters on the relative injustices of defying natural laws I fell asleep and napped for two hours unencumbered by the prospect of work. It is so nice to be on break. By the time I was done studying, the idea of leaving the house to get ingredients seemed daunting as the sun set and the rain poured down. Some winter we've been having. But, since I am embracing the relative merits of rainy days I decided to make something out of what I already had in the cabinets and refrigerator. My linear algebra teacher last semester joked that he would put a question on our exam asking us to make a dish out of the elements that he listed from his apartment. Needless to say, he did not and the questions that he did put on were a trifle more difficult. 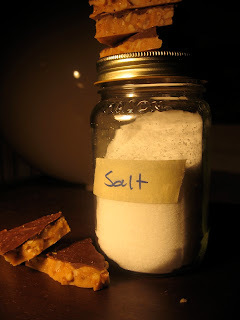 However, not only did I want to make a dish that I already had the ingredients for, I also wanted to try something new and after searching various blogs and cookbooks, I came upon a recipe for walnut chocolate toffee brittle with sea salt, which I don't think has quite enough modifiers. To begin, I melted four sticks of butter (2 cups) with 2 cups of white sugar and a pinch of salt. This will take a few minutes to melt and you should help it along by mixing and simultaneously breaking up the butter. After it has melted, stir it into a homogenous mixture and put the flame on medium high. Within five to ten minutes the mixture will come to a boil and you should mix periodically during this time interval. For the next ten or so minutes, I mixed the brittle continuously to make sure that it did not burn. You should do this until the mixture is a dark amber or 300 F on a candy thermometer, which I do not own, and then stir in two cups of chopped up walnuts (or pecans, peanuts, almonds...) and make sure they are evenly distributed. Before hand, I lined two cookie tins with tin foil. You should pour the mixture onto these tins and then use a metal (not a plastic) spatula to spread it around until it is about 1/4 inch thick. Wait a minute or so and then pour two cups of semi-sweet chocolate chips on top. These will take four or five minutes to melt and then spread the chocolate around with a spatula. After a few minutes, sprinkle on your sea salt and put the brittle in the freezer for 30 minutes so the chocolate solidifies. When you take it out, break it up into little pieces (the size is up to you but mine were mostly 2 1/2 to 3 in. long and 1 in. wide. I stored them in a plastic container in the fridge and put pieces of wax paper between the layers so the candies don't stick together. Rainy days do have their place. They make you slow down and devise your own entertainment, whether that is an old movie or making brittle and licking the spatula covered with melted chocolate. But for tomorrow...rain rain go away come again some other day little Nika wants to play. gorgeous photos again and can't wait to try one (if any are left)!